Not just anybody can call their mother a squawking chicken and get away with it; then again, from her memoir, Elaine Lui (Lainey Gossip) has a pretty distinctive mother. “As soon as you hear her, you’ll never forget her,” Lui promises, revealing that “Squawking Chicken” is actually a nickname her mother earned when growing up in Hong Kong because of her “wailing siren” of a voice. We don’t literally hear the Squawking Chicken’s voice and Listen to the Squawking Chicken is ostensibly more about the author’s relationship with her mother rather than the mother herself, but indeed it is the character of the mother that dominates this book and leaves a lasting impression on the reader’s mind. Most people think I’m exaggerating at first when I talk about the Chinese Squawking Chicken. But once they actually spend some time with her, they understand. They get it. Right away. She’s Chinese, she squawks like a chicken, she is totally nuts, and I am totally dependent on her. With such a title, Lui faces the risk of turning her own mother into a caricature, yet her obvious affection for the woman shines through, and even at her most “wailing siren” moments, Lui’s mother still retains the complexity and tenderness that makes her such a memorable figure. The Squawking Chicken is at times a harsh mother, her love for her daughter expressed by making sure her daughter is well equipped for life’s disappointments. On the subject of Miss Hong Kong, she immediately dismisses her daughter’s chances, saying that her daughter didn’t inherit her good looks enough to be a contender for the title. When asked why she tells her daughter ghost stories rather than fairy tales in bed, she quite reasonably points out that it is the hard times that we should prepare for, not the good things that will happen. And when her daughter gets a bit too proud of a high mark in class, the Squawking Chicken loudly and publicly bemoans her arrogance given such an inconsequential achievement. In a world and at a time when children are routinely praised just for trying, it may be difficult to appreciate this somewhat harsher form of parenting, yet underlying it all is such an obvious desire for her daughter to be prepared for life. Lui also gives us insight into her mother’s story, which reveals much about why she may have adopted such a parenting style. The image of the demure Chinese woman is a completely outdated stereotype, yet Lui’s mother does challenge the traditional Chinese adage about not airing dirty laundry in public. She is fearless in taking any family member’s dirty laundry to public eye, and in one of my favourite scenes, loudly and publicly confronts the mistress of one of her friends’ husband. The reason for this becomes clear as we learn more about her childhood, and the incident that tips her over and forces her to unleash her voice is horrific and somewhat inspiring, a superhero-level epic origin story that transforms an ordinary, nice woman into a remarkable figure. 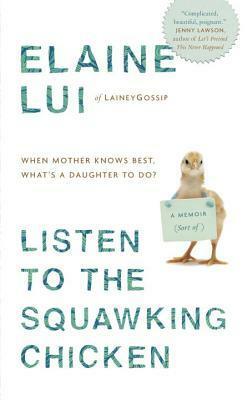 Lui’s mother is fearless, because she has to be, and she teaches her daughter this same fearlessness. She is a dominant figure in her daughter’s life, and certainly after this book, she will also be a dominant figure in our imaginations. Peppered throughout the book as well are some useful life lessons — don’t cut bangs after thirty, eat a papaya a day (but for Lui’s husband, it must be a banana instead, because reasons) and don’t be “low classy”. Likely, nothing will happen if you don’t obey, and anything that does happen is likely just self-fulfilling prophecy. But, just in case, it can’t hurt to eat that papaya, can it? Thank you to Random House Canada for an advance reading copy of this book in exchange for an honest review. This entry was posted in Book Reviews and tagged 50BookPledge2014, Non Fiction, Random House by Jaclyn. Bookmark the permalink. This is not a review, it is an overview. There are virtually no critical nor constructive points in this entire piece.